Legislation that would have significantly expanded the ability of New Jersey real estate brokers and salespersons to offer broker price opinion services did not become law because of a Jan. 21 “pocket veto” by Gov. Chris Christie. This is the second time Christie has vetoed BPO legislation. The legislation (S. 3058) was passed by both houses of the New Jersey legislature Jan. 6, and was presented to Christie for his consideration. However, because the bill was passed by the legislature during the last 10 days of the 2012-13 legislative session (which ended Jan. 14), the governor only had seven days in which to sign or veto the bill or it would fail to become law. Christie did not sign the bill nor return it to the legislature with an absolute or conditional veto. Therefore, the legislation failed to become law when the seven-day consideration period ended Jan. 21. This is the second time during the 2012-13 legislative session that Christie has vetoed BPO legislation. Similar BPO legislation was vetoed by the governor Aug. 19, 2013. In his veto message at that time, Christie noted his concerns about “consumer confusion,” and the impact on “sellers struggling to determine when and why to use broker price opinions, comparative market analyses or appraisals.” Because the veto of this bill was a “pocket veto” with no possibility for further legislative action such as an override, the governor provided no rationale for his decision. 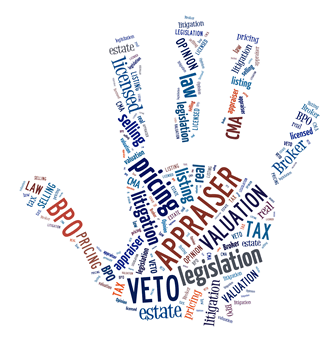 Under current New Jersey law, real estate brokers, broker-salespersons and salespersons are limited to preparing BPOs for the purpose of giving “counsel and advice on pricing, listing, selling and use of real property, directly to a property owner or prospective purchaser, if the intended use of the counsel or advice is solely for the individual knowledge of or use by the property owner or prospective purchaser.” Additionally, brokers, broker-salespersons and salespersons may offer real estate valuation services for state or federally chartered banks, savings banks or savings and loan associations in conjunction with federally related transactions for which an appraisal by a certified or licensed appraiser is not required by federal law. The provisions of S. 3058 would have allowed New Jersey licensed real estate brokers, broker-salespersons and salespersons to offer BPO services for virtually any purpose, including property tax appeals, litigation support, financial institution portfolio valuation and distressed loan workouts, among other things. View a copy of S. 3058.